Sports field construction and track and tennis court construction are very specialized trades and there are specifications that are unique to those companies, which engage in the work of building athletic facilities. Owners want to make sure the company they choose has persons on staff with the specific experience to do that work well. 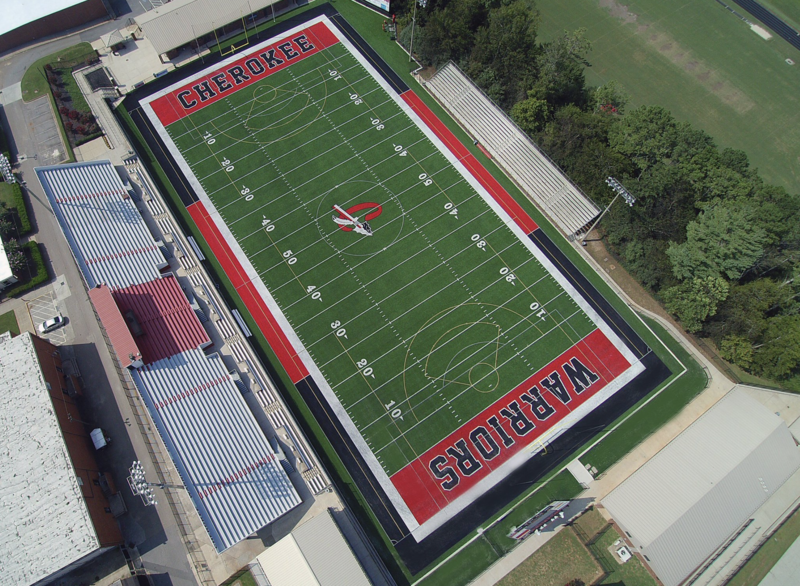 Specifications vary depending on the project, but include natural grass fields with underdrain systems, blended root zone systems, artificial turf field construction, drainage improvements to natural grass fields in the form of sand slit drainage systems and development of running track construction projects. For example, in the case of running track construction, the sports surfacing contractor and construction contractor should be the same contractor, not two separate entities, to ensure accountability and a consistently good performing running track that will last over time. Another important component to include in specifications is the American Sports Builders Association’s certified builder program. Sports Turf Company’s four Certified Field Builders and two Certified Track Builders and Certified Project Managers are required to be involved from start to finish of a project and not just on the periphery. They are among the most qualified in the industry to assist owners and architects with project specifications. By having passed a rigorous comprehensive exam on field or track construction and maintenance, Certified Field Builders (CFB) and Certified Track Builders (CTB) have demonstrated the highest level of expertise. Certified Builders must be well-versed in project planning, project administration, site work, sub-grade, base work, and maintenance. Certified builders must have at least three years of experience and at least twenty projects built, before even taking a comprehensive exam. They must perform enough athletics construction projects and be invested in their field to justify paying the $600 fee to take the test. By having specified a Certified Field Builder or Track Builder, you have prevented the average landscaper or a builder, who happens to have a little extra bandwidth, but has very little experience, from cutting their teeth on your project. Unfortunately, many of the folks who offer a price on athletics construction work really do think they are great at what they do, but without a process by which to measure greatness, the owner is the one who suffers. The other challenge with not holding a high enough specification such as requiring a Certified Field Builder or Track Builder, is these less qualified proposers will offer a lower price commensurate with the quality of their work, positioning elected officials to either take the lower bid and suffer the consequences, or to justify why they selected a contractor that is sometimes substantially higher in price. A Certified Field Builder or a Certified Track Builder can help develop a realistic budget, layout, and then build your facility to meet or exceed national best practices. They are best positioned to solve problems as they arise during construction, and adhere to Certified Builder Standards of Conduct. Perhaps as important as having a CFB or CTB employed by a construction company, is to have that CFB or CTB onsite during construction. ASBA actually forbids a CFB or CTB from farming their certification out to help companies meet the standard. A CFB or CTB may not have a relationship with more than one company at any given time and may not facilitate any party in misrepresenting itself as having a CFB or CTB in order to circumvent a bid contract requirement. That means if an owner specifies the awarded contractor to have a CFB or CTB on staff, they actually have to be on staff because that company can not go out and subcontract to an individual who holds this certification to meet the requirement. Athletic projects can be complicated. The geometry involved in various running track designs would overwhelm a high school math teacher. It is important to remember that a 399.9999 meter track is not a regulation 400 meter track. Surface smoothness is measured at .125” over ten feet. Tolerances and guidelines are incredibly tight because athlete’s times are measured in .100 of a second. Standards are set by three different governing bodies with respect to running track and field, NCAA, NFHS, and IAAF.